The peace process in the Nagorno-Karabakh region will be fruitful only if the troops are withdrawn from occupied Azeri territories and displaced people return, Elmar Mammadyarov Foreign Minister of Azerbaijan told RT. ­No war, no peace – the stalemate between Armenia and Azerbaijan has lasted for over sixteen years. The conflict dates back to 1988. The Nagorno-Karabakh region, mainly populated by Armenians, was part of the Soviet republic of Azerbaijan. After the collapse of the USSR, it declared independence which resulted in several years of armed conflict. A truce was signed in 1994 – Russia, France and the US have been mediating talks since then. RT: What role does Azerbaijan play in stabilizing the Caucasus region? Elmar Mammadyarov: Of course, Azerbaijan is all for the settlement of all conflicts. In this case, if we're talking about the situation with the Nagorno-Karabakh conflict, the factor of predictability is a crucial one. Well, considering the fact that over 20 per cent of our territory was occupied and ethnically cleansed from all Azeri nationals – I mean there is literally not a single Azeri there – it is hard to talk about neighborliness and promote peaceful regulations. But anyway, this is why I have come to Moscow – to continue searching for a peaceful solution in the 2+1 format. RT: As for the Nagorno-Karabakh conflict. The declaration was signed in 2008 and there is a passage there saying that certain measures are required to increase confidence in the military field. Can you please comment on those words, explaining what they imply? EM: In this case we are talking about the contact line between the armed forces of Armenia and Azerbaijan. Unfortunately, despite signing for a suspension of hostilities, clashes still occur leading to the deaths of both soldiers and civilians. We are to take more effective measures to resolve this issue. There are mechanisms to foresee possibilities to decrease the tension. I have to say that if the Armenian armed forces cross the border of the occupied territories, the factors of stability and predictability will be many times higher. RT: What short-term goals do you see in reaching the settlement? 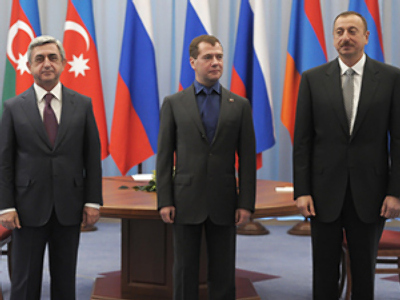 EM: We can’t speak of solving the Nagorno-Karabakh conflict in terms of short-term goals. There is a huge bundle of contradictions about it. But the issue of creating predictability in the region can be a short-term goal, first and foremost, to make attempts to decrease the military factor. And first of all, the military factor means the occupation of territories. What’s been suggested and discussed for the past six years in the Prague Process and in the Madrid Principles suggested by the Russian, US and French co-chairmen, is first and foremost related to phasing decision making. By phasing decisions we understand the quid pro quo principle – troops’ withdrawal facilitates the opening of communications, the return of the displaced people, encourages the work of economic institutions, growth of the economic component, and provides for peacekeepers’ security. There is a document saying in what direction we should make steps. It was suggested by the Russian, US and French co-chairmen and read as an announcement at the latest G8 summit in Canada. They say the devil’s in the detail. And we are to decide on the details now. What I can assure you of is that it’s impossible to preserve the current status quo. We are to do the utmost to find a way out. RT: In October 2010, Azerbaijan and Armenia reached an agreement on an exchange of war prisoners and dead bodies. Was it fulfilled? EM: Of course. Both the war prisoners and the dead bodies – and there was a situation with the civilians – were exchanged. And I am to thank Russia for their assistance. 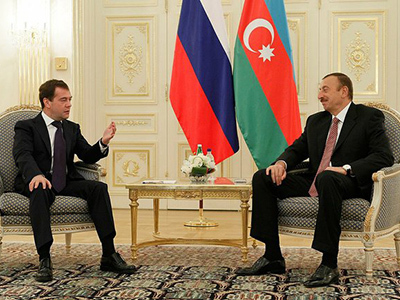 President Medvedev personally committed to the resolution of this issue. And in the end we reached a compromise in this situation. RT: Can we call it one of the first steps on the way to reach a settlement of the conflict? EM: You know, I think the most important one was the declaration of 2008. 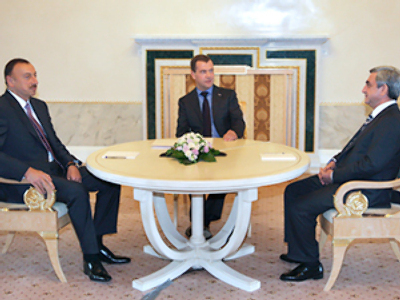 For the first time ever the presidents of Azerbaijan, Armenia and Russia signed a joint declaration, which is often referred to as the Maindorf Declaration, or simply the Moscow Declaration, which stipulates political criteria of conflict settlement, like a conflict should be settled based on the principles of international law and in line with the relevant international agreements and resolutions. There are four UN Security Council resolutions adopted back in 1993 that are unfortunately being violated, which also contain a call to Armenia to withdraw their troops from Azerbaijani territory and underline the importance of returning all the internally displaced persons and refugees to their permanent places of residence and of easing military tensions. After the adoption of those UN Security Council resolutions, other international organizations followed suit by adopting additional treaties – a resolution by the European Parliament, a resolution by the Parliamentary Assembly of the Council in Europe, a resolution by the Organization for Security and Co-operation in Europe – OSCE, and by all the other international organizations, who understand that settlement can only be reached gradually and that occupying the territory of another state is absolutely unacceptable. RT: The negotiations on the Caspian Sea Convention. Could you tell us why the negotiations are so difficult and why this Convention is needed at all? What are the factors holding it back? Why have the negotiations lasted for so long? EM: Let me start with a little prelude describing the background of the issue. After the disintegration of the Soviet Union, several new states emerged in the Caspian area. As is only natural, the legal regime that existed in the Caspian area since the times of the Soviet Union and Iran, had to be modified taking into account the emergence of Azerbaijan, Kazakhstan, Turkmenistan, plus, of course, the Russian Federation and Iran. In this context, negotiations began with the purpose of defining the legal status of the Caspian Sea: in what form and which part should be divided, and the idea for the division of the Caspian Sea. They have lasted for a rather long time, of course. The crucial thing is how to estimate the historical period. I mean whether or not 20 years is long enough as a historical period, or it is not, this sort of thing. RT: As far as we know, Iran failed to recognize the tripartite agreement between Russia, Azerbaijan and Kazakhstan. Will this agreement yet be discussed with Iranian colleagues? EM: The theme that we have coordinated with the Russian Federation and Kazakhstan – the demarcation of the Caspian Sea along the median line in accordance with the coastline – has found its legal corroboration and is actually an agreement, as you said, between Azerbaijan, the Russian Federation and Kazakhstan. Iran has an approach of its own. Generally we believe that this approach doesn’t reflect the realities that have taken shape in the Caspian area. As for Turkmenistan, its approach is generally in support of the median line, but we have different points of calculation in how to figure out where the median line is. But this in no way prevents us from developing bilateral positive tendencies in other matters. 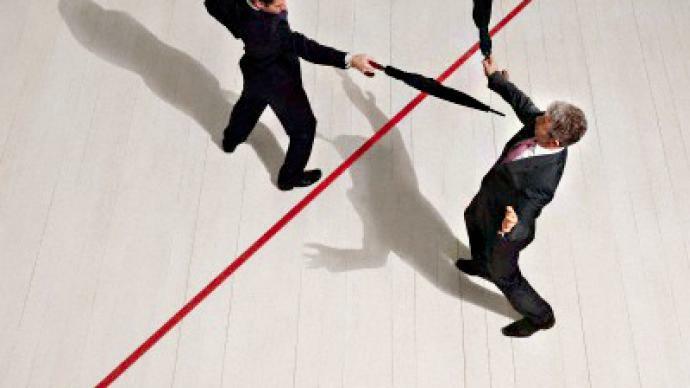 RT: But what is it that makes Iran dissatisfied with the median-line demarcation? EM: Basically, the Iranian side wants 20 per cent of the Caspian, which doesn’t reflect the existing realities and what we have come to terms with on the Russian side and the Kazakhstan side. On the whole, there is a common understanding with the Turkmen side. We say this: If four states accept the median-line principle, the fifth state, accordingly, ought to join the majority. The Iranian side is aware that the negotiations should be continued in order to find common ground and a way out of the predicament. And, in principle, I am rather optimistic that, over time, we’ll resolve this problem. RT: There is a view that Azerbaijan to some extent is playing on the contradictions regarding the South Stream pipeline. It sells its gas both to the EU and Russia, and it says it has enough resources. Does it really have enough resources? EM: I can hardly agree with you where this word, “contradictions,” is concerned. I don’t think it’s quite correct. Our position is this. We should in the first place disengage politics from commerce. From the commercial point of view, as is only natural, every energy-producing country seeks to come to markets that are of most interest for it in the sense that they can offer a decent price for its energy resources. As far as delivery is concerned, all options here are still open, as we are in our negotiations, we are guided by considerations of national interests, and commercial potential is, of course, a key part of those considerations. If there's a good price, it should be offered and delivered. RT: You mentioned some important environmental issues related to the development of the Caspian Sea that were addressed. Could you elaborate on that? EM: First of all, Caspian state leaders decided to establish a work group that was to come up with propositions regarding the preservation of sturgeon and their spawning sites. Since the preservation of sturgeon was deemed very important, all measures are being considered, all the way up to imposing a total ban on sturgeon fishing. There are different grades of sturgeon and it's a commonwealth of all the five Caspian states. RT: Did the BP oil spill in the Gulf of Mexico have any impact on the decisions taken in this field? EM: You know, environment-related requirements to oil companies have become stricter, of course. As for gas extraction, the issue of environment protection is not as pressing there as with oil, but, with the global experience and international standards according to which underwater pipelines are laid, nothing bad has happened so far. Our experience of offshore oil extraction for the Baku-Tbilisi-Ceyhan pipeline shows that if all international standards are observed, most projects are quite feasible. RT: The final question concerns more the area of international relations. 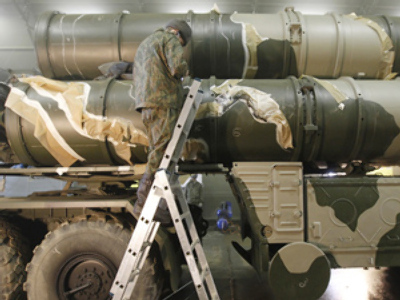 Does Azerbaijan share the concerns of the international community about the Iranian nuclear program? EM: You know, Azerbaijan has a clear position regarding this – any IAEA member state is entitled to its own peaceful nuclear program. If it is in line with IAEA regulations and peaceful nuclear cooperation, it is possible and justified. Also watch interview with Eduard Nalbandyan, Foreign Minister of the Armenian Republic.